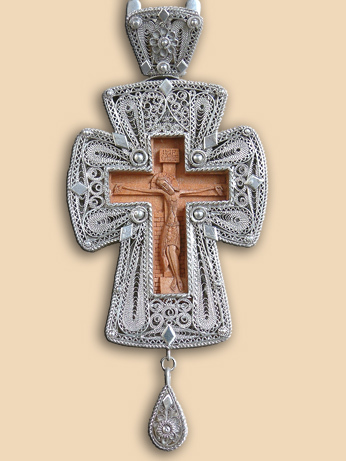 Pectoral cross in silver filigree. 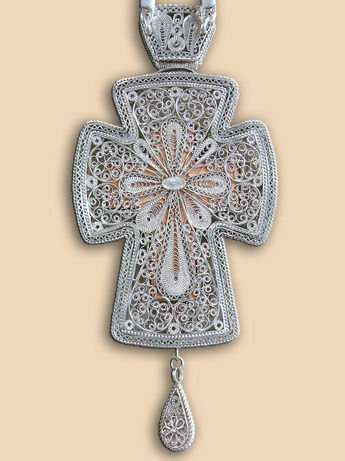 Size: cross 15 × 6.5 cm., silver chain 120 cm. Weight: cross 110 grams., chain 50 grams. Commissioned by: Protopresbyter-staurophor Dr. Zoran Krstic, Dean of the Orthodox Seminary in Kragujevac. In possession of : Protopresbyter-staurophor Dr. Zoran Krstic, Dean of the Orthodox Seminary in Kragujevac.